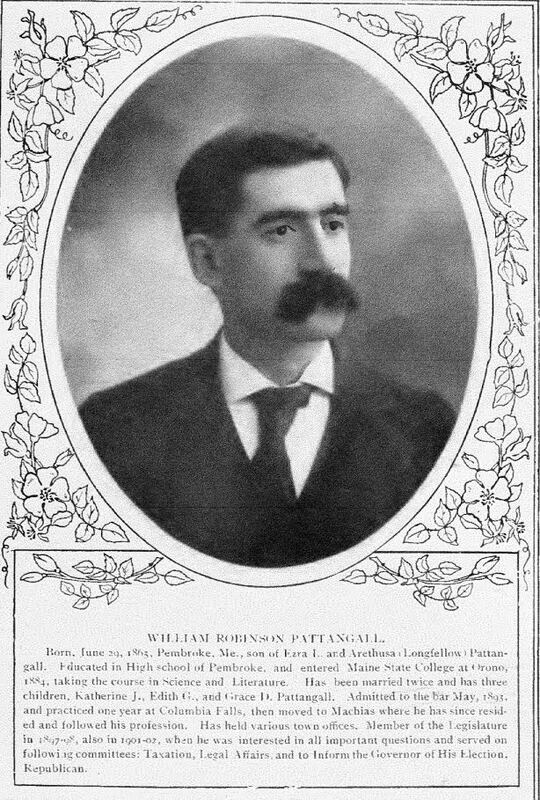 Born in 1865 in Pembroke, William Pattangall married Jean M Johnson of Calais in 1884 while he was studying law with the distinguished Calais attorney Archibald MacNichol. Craving adventure, he left the study of law for a time to sail “before the mast” as an able body seaman but after a couple of years returned to the law and politics. He became one of the preeminent trial lawyers in the state and eventually Chief Justice of the Supreme Court of Maine. He also held numerous political offices, ran for governor and was the editor of newspapers in both Machias and Waterville. He was most famous, however, for his writing, especially his biting political satire which is most evident in the “Meddybemps Letters”: a series of newspaper articles published under the pen name Stephen A. Douglas Smith. One such article took aim at the political situation in Calais 100 years ago. Our preeminent historian Ned Lamb wrote tells the story. By way of explanation George Curran was Calais’ version of Boss Tweed at the time. “Once upon a time”, as those nice stories used to begin, there was born in Pembroke in 1865, a boy by the name of William R. Pattangall, who when he grew up, became a brilliant lawyer and a Democrat, or some would say a brilliant Democrat and a lawyer, but they should have said that he became both a brilliant lawyer and a brilliant Democrat. He was the editor of the Waterville Sentinel, member of the Maine House for four terms, candidate for Governor, At­torney General of Maine, Mayor of Waterville. All this shows the caliber of the man. In 1903 there began to appear in the Machias Union a series of letters signed by “Stephen Douglas Smith”, which jumped the circulation of the Union at once because so many wanted to see what Patt would say next, and who he would make a tar­get of with his wit. Of course he aimed at the members of the other political party and he could, and did, de­liver addresses of the most brilliant type. He wrote the Meddybemps Let­ters under the name of “Stephen A. Douglas Smith”, but just why he took the name of the man who de­bated with Abraham Lincoln we do not know. His eighth and ninth letters are dated from Calais. “Mr. Smith at Calais Jan. 7, 1904”, his eighth is headed. There is very little about Calais in it, mostly Port­land. He wrote: “Both hotels are owned by one company, so the clerk told me this afternoon, but I sus­pected it when I read the bill of fare.” The next. letter, “‘Mr, Smith at the Syndicate Hotel”, is really about Calais. He says: “The principal in­dustry of this town consists of a steel bridge connecting it with the English side. The bridge didn’t cost over $50,000, unless it was built by the Calais City Government, in that case it must have cost more”. These are but samples of “Patt’s” wit, which runs through 25 letters under the name of “Mr. Smith”, and gives his attention to 25 leading politicians in the State (All Repub­licans, of course).